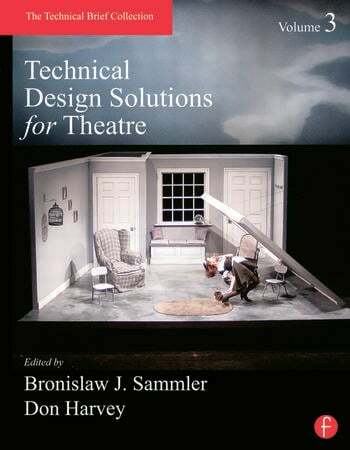 Technical Design Solutions for Theatre is a collection of single-focus articles detailing technical production solutions that have appeared in The Technical Brief Collection, a publication of the Yale School of Drama’s Technical Design and Production Department. The primary objective of the publication was to share creative solutions to technical problems so that fellow theatre technicians can avoid having to reinvent the wheel with each new challenge. The range of topics includes scenery, props, painting, projections, sound, and costumes. Each article describes an approach, device, or technique that has been tested onstage or in a shop. Bronislaw J. Sammler is the Production Supervisor of Yale Repertory Theatre, and has been the Chair of the Yale School of Drama’s acclaimed Technical Design and Production Department since 1980. In 2007 he was named the Henry McCormick Professor (Adjunct) of Technical Design and Production by Yale’s President, Richard C. Levin. He is co-editor of Technical Brief and Technical Design Solutions for Theatre, Vols. I & II. He is co-author of Structural Design for the Stage, which won the United States Institute of Theatre Technology’s (USITT) Golden Pen Award. Demonstrating his commitment to excellence in technical education and professional production, he co-founded USITT’s National Theatre Technology Exhibit, an on-going biennial event: he served as a commissioner and a director-at-large and is a lifetime Fellow of the Institute. He was honored as Educator of the Year in 2006 by the New England Theatre Conference and was chosen to receive the USITT’s Distinguished Achievement Award in 2009. His production management techniques and his introduction of structural design to scenic technology are being employed in both educational and professional theatres throughout the world. Don Harvey came to the Yale School of Drama’s Technical Design and Production Department as a student in 1982 and joined the faculty immediately upon his graduation. Until his retirement in 2012, he taught courses in Technical Writing and Computer Applications, served in multiple managerial capacities, and wrote over a dozen database applications that serve the Drama School in key functions including estimating, budget tracking and reconciliation, and student assignment and payroll processing.